Do I have to be a Catholic to attend Campus Ministry events? No. The Department of Campus Ministry is at the service of all of our students, faculty, and staff. There is no denomination or religious affiliation requirement to attend Campus Ministry events. However, you may find that some events are more appropriate to your needs than others. For example, some events may have a more general Christian focus while others may be specifically Catholic worship services, and still others are offered for wider spiritual, moral or ethical pursuits and questions. Not Christian? Find our interfaith information here. Do I have to be Catholic to attend Mass at the Chapel? No. The Catholic Mass is not intended as an exclusive event. Nevertheless, the Mass is a Catholic service, which means it belongs to a specific tradition. Religious Traditions generally make use of a particular language of signs and symbols that is meaningful to their membership and may seem foreign or different to others. For Christians in general, a Catholic Mass will offer the possibility for listening to the proclamation of Holy Scripture (the Bible), a short sermon, and a memorial of the Lord's Supper. Members of other traditions are welcomed to attend the services. You may contact the Department of Campus Ministry for help on understanding the service and for worship aids for your participation. What are the differences between Catholics and other Christians? In essence, Christians are closer to one another than their differences seem to imply. Catholics are Christians, and all Christians are baptized in the name of the Trinity (Father, Son, and Holy Spirit) and are disciples of Jesus Christ. All Christians believe that the Scriptures are inspired by God and include the books called the New Testament in their "canon" of Holy Scriptures. This means that all Christians are members of the same religion. Sadly over the centuries Christian communities have divided over differences in creed, ritual and leadership. Orthodox Christians and Catholic Christians have almost exactly the same creed except for the filioque (Holy Spirit proceeding from the Father and the Son). They differ more in ritual and in leadership. The Catholic Church is led by a college of Bishops with the Roman Bishop (Pope) as their head. The Orthodox Church has bishops and patriarchs for their leadership. There are some Orthodox groups today who are in full communion with the Catholic Church. These Churches follow their ancient rituals and their patriarchs are in communion with the Roman Pontiff. Later divisions among Christians in the west developed differences in creed, ritual, and leadership. This is called the period of the Reformation; it is the origin of what we refer to today as Protestant churches. The leadership of the new Christian communities no longer recognized the Roman Pontiff (Pope) as the guardian of the communion of all Christians under one faith. In ritual, many of the Protestant communities celebrate Baptism and the Lord's Supper. Catholic and Orthodox Christians also celebrate Baptism and Eucharist (the Lord's Supper). They celebrate these rituals along with five other major rites called Sacraments (Confirmation or Chrismation, Sacrament of Reconciliation, Anointing of the Sick, Marriage and Ordination). The Anglican Church (Church of England) is very close to the Catholic tradition. The Anglican Church is led by a college of bishops and the English monarch. The Anglican Church celebrates the same sacraments as the Orthodox and Catholic Church. The Anglican Church considers itself both Protestant and Catholic. Other Christian denominations celebrate similar rituals like marriage and ordination, but they do not consider these to be sacraments instituted by Jesus Christ. Besides leadership and ritual, differences also developed in beliefs such as Purgatory, prayers for the dead, the 'veneration' (not adoration) of the saints, the authority and mystery of the Church "visible", and some beliefs about Mary the Mother of Jesus (virginity after the birth of Christ, Immaculate Conception, and her Assumption into Heaven). Many of the differences in confession stem from Catholic, Orthodox and Anglican Christian belief that both Bible and Tradition are the primary sources for Christian faith, whereas Protestant Christians give sole authority to the Bible. From the communities that developed out of the Reformation there was a further division, which formed smaller communities. These communities struggle to live Christian discipleship in the simplicity of what they consider to have been the earlier Christian Church. Many of these groups are similar to what Catholics call "religious communities" or orders within the Church. They tend to be Charismatic in origin and seek to live their discipleship in accordance with the witness of the Holy Scriptures. This does not mean that those that came before them do not seek to do the same. The idea of the new communities was to "purify" Christian life from what they believe to be many aggregate layers imposed upon it from philosophies, pagan cultures, and other foreign influences. Centuries of arguments and ideas have developed into many different denominations and expressions of discipleship. Today there is a movement among Christians to seek full communion with one another. This ecumenical move has come from the realization that the division among Christian communities constitutes a scandal and a witness against the one faith in Jesus Christ. There are many ways in which we express and put into practice our concerns for the needs of others. We generally refer to charity as helping someone in need. While helping someone in need is a necessary and laudable action there is another question that must be answered. Why is this person or persons suffering? Social Justice asks the question why people suffer. It analyses social structures seeking the roots behind poverty, victimization, and violence suffered by human beings. In the Catholic tradition Social Justice is the consequence of its belief in the sacredness of humanity and God's call to care for all of creation. 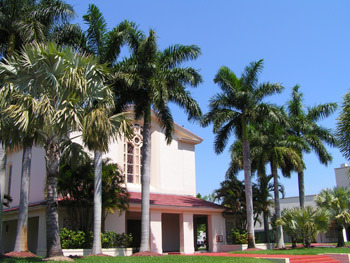 Barry University holds social justice as one of its core commitments. The University believes that a search for knowledge and Truth leads to the kind of concern that elicits the search for social justice. How do I go to Confession here? To schedule an appointment for confession please call Fr. Torres at 305-899-3836 or email ctorres@barry.edu. I am not a student at Barry; can I still come to events here? Yes. Barry University believes in inclusion and collaboration for service and community transformation. Campus Ministry events are planned with student, faculty and staff of the University in mind; however, these events are not meant to be exclusive. Depending on the event, there is often a direct invitation to the larger local community to participate.